Welcome to A. T. Manufacturing Company. Manufacturer and Exporter of Transparent Flip Top Caps. The company was established in 2000 at Mumbai. Our products are applicable in Beauty Products, FMCG and other sectors and we cater to Indian Subcontinent. International quality standards, extraordinary finish and durability help us to achieve an unrivalled position in the industry. We offer a huge gamut of Bottle, Plastic and Colored Flip Top Caps. Flip Top Caps offered by us are widely appreciated in the market. Bottle Fliptop Caps are best in the industry amongst others. We are instrumental in offering a wide array of Plastic Flip Top Caps that are available with us at cost effective prices. Our Colored Flip Top Caps are setting a benchmark in the market. 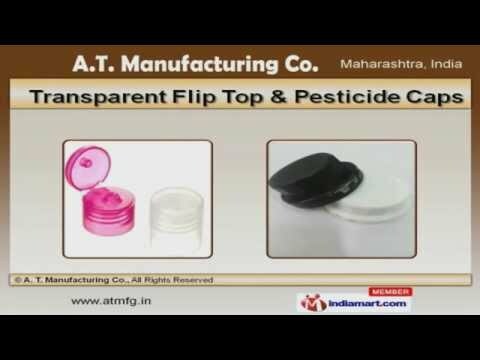 We have gained tremendous expertise in providing Transparent Flip Top and Pesticide Caps that are extremely reliable.